Selling real estate for a profit sounds like a great financial move – until you start looking into the tax consequences. If you want to keep as much money in your pocket as possible, it’s important to learn how to reduce and possibly even eliminate capital gains taxes for your sale. 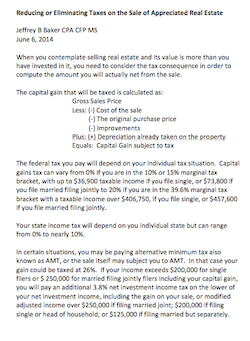 The federal tax you are required to pay depends upon your unique tax situation, but capital gains tax can vary from 0%-20%, and the state tax can range from 0-10%. In some situations, you may also need to pay alternative minimum tax – in this case, your gain could be taxed at 26%. That’s over a quarter of your sale! Who wants to pay that much money in taxes?